A DRIVER reading a newspaper at the wheel and another texting on a busy crossroads were among the many motorists busted during a police crackdown on Dales road offences. As part of Operation Lifegaurd, officers have been monitoring roads across Derbyshire to target drivers committing one of the ‘fatal four’ factors that contribute to road collisions. These are speeding, not wearing a seatbelt, using a mobile phone at the wheel and driving under the influence of drink or drugs. 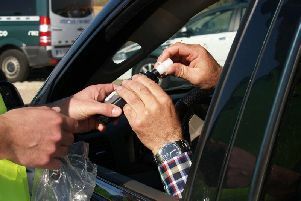 Among the stops – from locations at Cromford, Bradwell, Grindleford, Curbar and Buxton – 70 drivers were booked for seatbelt offences, 16 for using mobile phones at the wheel, three for speeding and one driver was fined £560 for using red diesel illegally. At Cromford crossroads, one driver was spotted flicking through a newspaper while driving along the A6. Chief Inspector Steve Wilson, head of Roads Policing, said: “Some drivers don’t realise how seriously the fatal four can affect your chance of being involved in serious or even fatal collision. “The majority of drivers stick to the rules but there are still pockets of road users that openly disregard them – and it is these drivers we are committed to educating and bringing to justice if necessary. The checks took place between Monday, November 19 and Sunday, November 26, to coincide with the national charity BRAKEs annual road safety campaign. The initiative is also part of a police campaign to make Derbyshire roads safer.